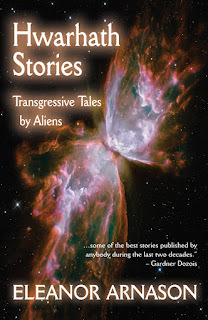 I'm please to announce the release of Eleanor Arnason's collection, Hwarhath Stories: Transgressive Tales by Aliens, which Aqueduct Press has published in both trade paperback and electronic editions. (You can purchase it now from Aqueduct Press.) Hwarhath Stories: Transgressive Tales by Aliens collects a dozen Hwarhath tales with commentary by their translator. As the translator notes, "Humanity has encountered only one other species able to travel among the stars. This species, who call themselves the hwarhath, or 'people,' are also the only intelligent species so far encountered. Of course, we interest and puzzle and disturb each other... The stories in this collection were written after the hwarhath learned enough about humanity to realize how similar (and different) we are. Our existence has called into question many ideas about life and morality that most hwarhath would have called certain a century ago..."
"One of the strongest collections of science fiction stories you’re ever likely to find. It’s hard to think of anybody other than Ursula K. Le Guin who was written better anthropological science fiction than Eleanor Arnason, and this very strong collection gather some of the best stories published by anybody during the last two decades." "Arnason's aliens are almost uniformly bisexual, and forbidden from engaging in heterosexual love beyond what’s needed for procreation. This behavior allows Arnason to adapt timeless folkloric tropes to her own modern, progressive, and wholly original reality, which comes alive in her precise, classically beautiful prose." "This is anthropological science fiction at its best, with only Ursula K. Le Guin rivaling Arnason in cultural insight and in the sophistication, complexity, and evocativeness of her worldbuilding. The hwarhath serve as a distorted mirror in which we can clearly see our own follies, foibles, peculiarities, and the inequalities of our society; the hwarhath, meanwhile, see humans as a distorted mirror in which they can see the peculiarities and inequalities of their own society. Arnason does her best work here at novella length, and I consider "The Potter of Bones" and "Dapple" to be among the very best novellas of their respective years, and as having an honorable place amongst the best SF novellas ever written. "The Hound of Merlin", "The Actors", "The Lovers", "The Garden", and "Holmes Sherlock" are also very strong; in fact, there's really nothing here that isn't worth reading. Coming as it does from a small press, you may not see Hwarhath Stories: Transgressive Tales by Aliens included on many lists of the best collections of 2016 as the year comes to an end, but believe me, it's one of them. It may even turn out to be the best collection of the year. "